To Laugh Often and Much.. I found a used copy of the book pictured above a few weeks ago: “Bedside Prayers, Prayers and Poems for When You Rise and Go to Sleep” collected by June Cotner. It has found a convenient home on my night stand. With decent regularity it finds its way into my hands just before lights out at night to put some meaningful thoughts to put into my head before sleep. “Bedside Prayers” has these words of description on its dust cover: a marvelous collection of prayers, meditations, sentiments, and quiet celebrations. Drawing from a rich spectrum of traditions and writers – from Rainer Maria Rilke to Robert Louis Stevenson, and from Buddha to contemporary writers with fresh insights… for spiritual seekers of any tradition… a charming companion that encourages us to recognize the divine gifts all around us each day. I find something meaningful every time I pick the book up and read a random page. Among my favorites found in “Bedside Prayers” is thirteen lines by George Eliot that encourage me to be grateful for each day and to live with courage and intent to leave the world a little better than I find it. In a poem written almost a hundred years ago Ranier Maria Rilke described the power of being in the moment long before it was a popular notion. 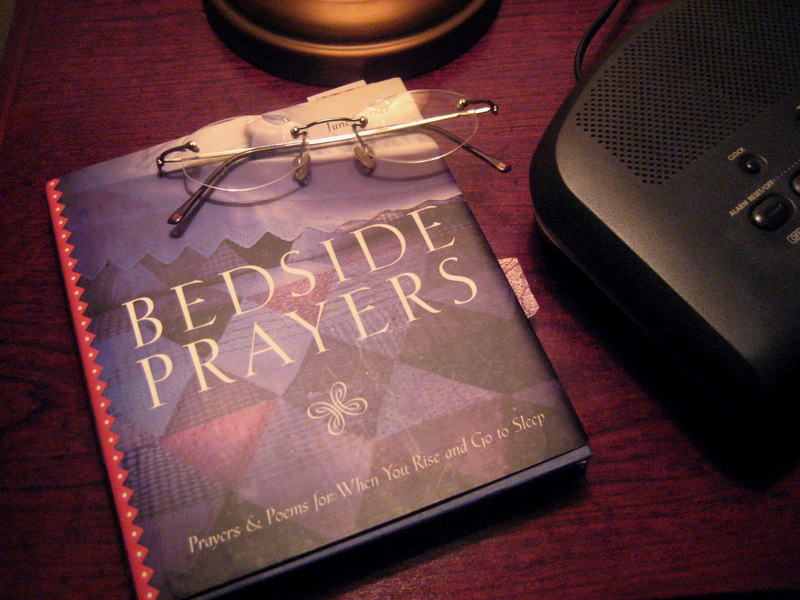 Being aware of one’s “aliveness” is the message he left to be printed in “Bedside Prayers”. First time through the following eight lines by Joseph Byron seemed to be only be a play on words. Then as I read them a second and third time it became apparent that simply changing the order of words added great meaning. I get the most from Byron when I read his forty-five word poem slowly and savor each line before moving to the next. Feeling strong and strongly feeling. Being glad and glad of being. Care for need and needing caring. Sharing self and selfless sharing. Full of spirit spirit filling. Will is warm and warmly willing. Life is love and love is living. Those eight lines really touch me! There is nothing new or original in what I offer gratitude for today. What is stated, I have written about before. Here again is my thankfulness expressed for the work of others that touch my heart and spirit and make me think. The canvas of an artist can have that effect on me and so can the notes of a musician. A script well acted can move me deeply as can the words of a writer, but few things touch me as quickly or as profoundly as a well written poem. Maybe I am old-fashioned. Maybe my soul has remnants within of the Victorian Era. Or maybe I feel deeply which allows my sensitive self to receive in great dimension the feelings, thoughts and sentiments in poetry. Whatever the reason may be, my gratitude is deep for the writers who put pieces of themself into measured word for me to discover, for my ability to feel what the poets left behind and for books like June Cotner’s “Bedside Prayers” that bring poetry into my life. This entry was posted in Knowledge, Simple Pleasures. Bookmark the permalink. 3 Responses to To Laugh Often and Much..
Hello James, I’m June Cotner, the editor of BEDSIDE PRAYERS. Thanks so much for your kind words about my book. I love the passages you chose for your blog. Many of my other books express gratitude: GRACES, COMFORT PRAYERS, SERENITY PRAYERS, HOUSE BLESSINGS, and even my animal books, ANIMAL BLESSINGS and DOG BLESSINGS. Wishing you all the best this holiday season! I am blown away to hear from you, but am glad you know how much I enjoy your books. I am honored that you took time to write me. I hope your holidays are filled with family and love… and the new year holds all you hope for and more.